General Finishes new Flat-Out-Flat offers a truly Flat sheen waterbased finish perfect for a low-lustre velvety look and feel. It is a durable, self-cross linking acrylic finish with similar characteristics to High Performance. It can be used under or over top of High Performance clear coats. 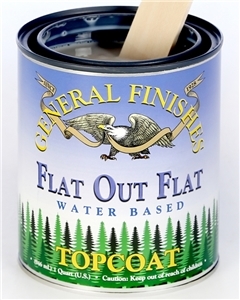 Flat-Out-Flat is an excellent choice for clear coating surfaces painted with Milk Paint or Chalk Paint. It will maintain the low luster, but offer a clear protective coating to reduce marring and scuffing of the painted surface. In addition to exceptional brushing and levelling properties, Flat-Out-Flat can also be sprayed very well with HVLP and other spray systems.